The days of elephants standing on two legs or balancing themselves on beach balls to entertain India’s circus enthusiasts are well and truly over. The ministry of environment, forests and climate change (MoEFCC) has passed orders cancelling the recognition of all circuses across the country that make wild animals perform tricks. The Central Zoo Authority (CZA) of the MoEFCC made this decision following year-long inspections and monitoring by officials in which extreme cruelty to animals was reported. The attempt to keep a check on animal abuse started last year. The ministry de-registered several circuses under the Prevention of Cruelty to Animals Act, 1960, to ban the training, exhibition and use of elephants for performances. But now the famed Apollo Circus and Great Golden Circus too have been struck out. However, owners have accused the inspection team of bias and making false allegations. Last year some of the circus operators moved court against the CZA’s cancellation order and also got relief. The court set aside the agency’s notification and observed that it should conduct a re-examination. Similar violations were found in the fresh inspection, following which a new cancellation order was issued. In 1998, the central government released a notification barring bears, monkeys, tigers, panthers, and lions from being exhibited or trained as performing animals. The order was issued based on the recommendations of a high-level expert committee, which concluded that cruelty is inherent in circuses and that wild animals undergo unnecessary pain and suffering when they are trained and forced to perform. Elephants were excluded from the ban, though protected under Schedule I of The Wildlife Protection Act, 1972. During its latest evaluation, the CZA team supported by animal rights groups and veterinarians found substantial evidence of cruelty and abuse against elephants. Following this, it has cancelled the registration of seven circus operators. According to the CZA, circuses cannot make animals perform without having proper facilities as prescribed under the Recognition of Zoo Rules, 2009. This includes appropriate housing with adequate space, waste management, no display of sick animals, ensuring the animals are not stressed and given proper medical care. 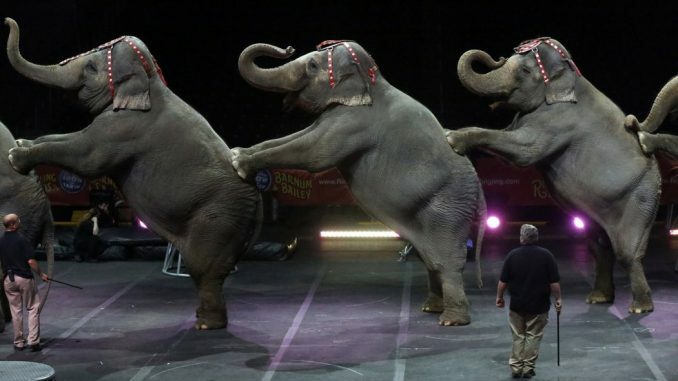 All the circuses evaluated were found violating the norms. CZA member secretary DN Singh confirmed to Mail Today the no circus in India is now recognised by the body. Experts say circus animals are often beaten by trainers and they suffer from loneliness, boredom and frustration from being locked in cramped cages or chained for months as they move from city to city. The circus owners claimed that they do not use the elephants for performances, but have kept them for ‘educational’ purposes. The fresh cancellation order mentions that the circus operators were given enough opportunity for several years to improve the situation but there was no progress. ‘De-registration process was carried out based on a series of investigations. The probe showed that animals were being maintained in circuses in cruel conditions and were tortured to extract performances. ‘Some of the owners of circuses even submitted morphed photographs to us in a bid to claim that animals were kept well,’ said Singh, adding that the CZA has adopted a virtually foolproof method to shut down circuses based on solid evidence such as videos. The zoo authority has also directed the chief wildlife wardens of states to rehabilitate the elephants from de-recognised circuses. The inspection team found that the elephants could hardly move because of injuries and pain. They were chained and banned pointed metal sticks were used to train them.